Just writing that title makes my mouth water. I love a well-made risotto, and this is my absolute favorite. I first tried this hearty dish some years ago at a little trattoria outside of Milano, Italy. The fields surrounding Milan need only the barest chill to become drenched in fog. I still remember the drive back to the city –nestled in the arms of the man I love, the road curving through through the rice paddies, the fog as thick as whipped cream, and my belly as full as can be with this lovely, lovely risotto. Well, maybe not exactly this risotto. I didn’t ask for the recipe, and even if I had, it would have been a little of this and a little of that… I have yet to meet an Italian who uses a written recipe on a regular basis. Fortunately, most Italian recipes are not complicated affairs piled with ingredients. If you’ve never made risotto, I hope these instructions don’t seem complicated. Risotto is labor intensive; you do have to stir it near constantly for about half an hour. But it’s not difficult. There are a few rules: You must use Arborio rice, and you must pay constant attention until it is cooked. Once you have the technique down, you can make risotto out of almost anything — asparagus, seafood, wild mushrooms, pumpkin… the possibilities are limited only by your palate and your imagination. Note on broth: Despite what you add to your risotto, most of the flavor comes from the broth. Chicken or beef will work, although if what you’re adding has a delicate flavor (i.e. seafood or saffron), you may overpower it if you use beef broth. It is certainly possible to make risotto from vegetarian broth, but it better be very good broth or your risotto may not taste like much. If you were to make vegetarian risotto, this would be a good choice. The strong-flavored radicchio would help make up for lost flavor. You can make decent risotto from canned broth, but the best risotto is always made with broth made from scratch — chicken or beef bones simmered for a few hours with carrots, onions, celery, and a sprinkle of salt. Skim the fat and strain the solids. Broth doesn’t get much better than that. Start your broth, either canned or (already) homemade, heating in a large pot. Heat the oil in a large (4 quart plus), thick-bottomed frying pan or pot, add the diced onions, and saute over medium heat. Meanwhile, chop the radicchio in quarters, remove the core, and cut the leaves cross-ways into 1/2 inch-wide strips. Once the onions turn translucent, add the butter. 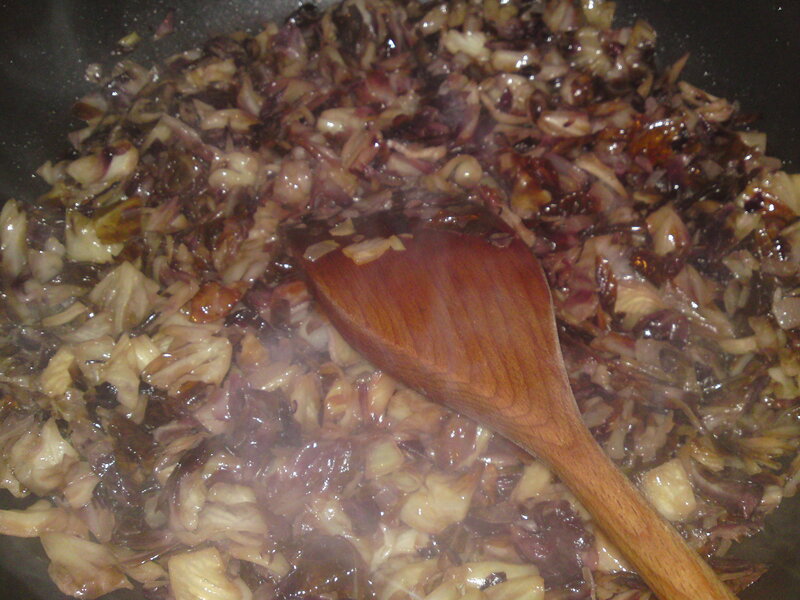 When the butter is melted, add the radicchio and saute, stirring regularly, until the strips are completely wilted. Next, you’re going to saute the rice kernels in the pan, and there needs to be enough oil/butter to coat them. They shouldn’t swim in oil, but if there’s not enough to coat them well, add another tablespoon each of oil and butter. 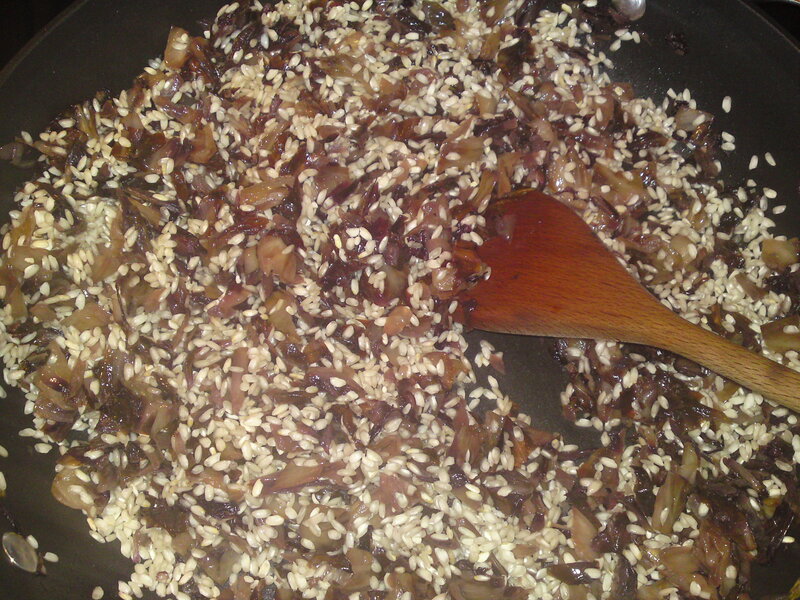 Add the rice and saute for a few minutes, stirring constantly. The rice should not color at all, so if you’re pan seems hot enough to do this, turn down the heat. If your broth is not yet simmering hot, turn off the rice and radicchio mixture and wait for the broth. Once the broth is hot, add a ladle or two to the rice mixture and stir it in over medium-low to medium heat. You want it to absorb the broth within a couple of minutes without drying out or sticking to the pan. Continue stirring constantly, making sure to reach the edges of the pan and move all the rice around. Once the broth is absorbed, add another ladle full. As each round of broth is absorbed, a thick “sauce” will form around the rice. This sauce should be dense but not dry. Continue this process for 15 or so minutes. 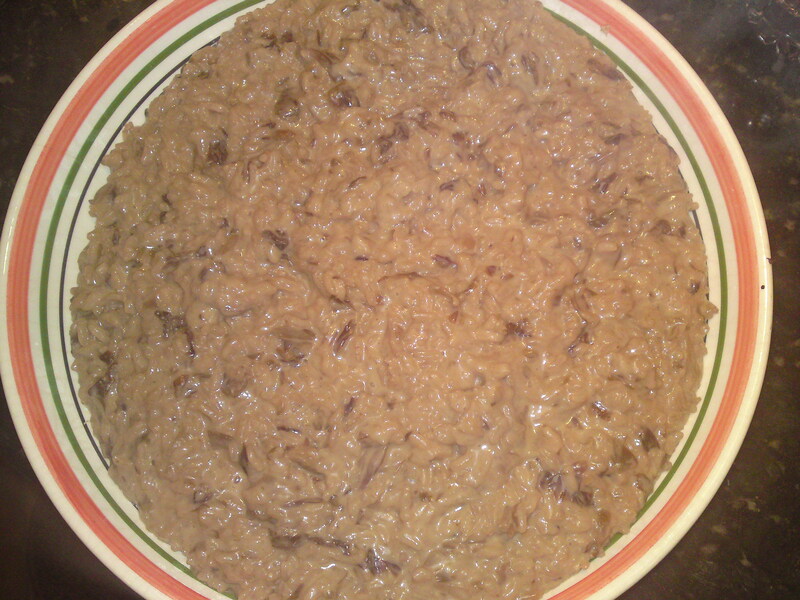 The risotto can take as long as 20 to 30 minutes to cook, but you do not want it to over cook. After 15 minutes, taste a kernel of rice to see if it is al dente. When properly cooked, it should feel firm between your teeth, but give way easily (without crunching!) when you bite down. Continue the broth/stirring routine until your kernels are al dente. Not sure if it’s ready? Bite a kernel in half. The coloring in the center should be barely distinguishable from the rest of the kernel. If you start to run low on broth, you can add hot water. You never want to add more than 20% hot water as it will diminish the taste. Once you’ve reached al dente, turn the flame down to low. Add the grated smoked mozzarella and stir. This dense cheese will thicken the risotto considerably, and that’s why we have cream on the the ingredient list. Once the cheese has melted into the risotto, add 1/4 cup of the creme and stir. If the rice seems creamy yet still dense, serve immediately. If not, add some more cream. Don’t add any more than necessary as you’ll be diluting the flavor. And if you accidentally add too much, a couple more tablespoons of mozzarella or some grated Parmigiano will thicken it back up. A parsley sprig or shredded raw radicchio would have made a nice garnish in this next picture. In fact, a couple of more photos for this post wouldn’t have hurt a bit. Apparently we were all focused on eating! If there are any leftovers, tamp into a hot, buttered skillet and heat until the bottom just starts to brown. Flip and repeat. Once browned, the smokey flavor of the mozzarella really comes out. YUM! P.S. Due to my hectic holiday season schedule, I may not manage a weekly post. I’ll try, but please forgive me if it doesn’t happen. Bet I can find a funny story or two to fill in some gaps. Any subscribers interested in writing a “guest” post? Just let me know.